Tobacco growing and processing dominated Virginia's economy for over three centuries, and transformed its landscape. Tobacco wears out the land, exhausting minerals and nutrients from the soil. The first Virginia colonists to acquire ownership of land were positioned to gain great wealth, permitting them to abandon old fields and plant in fresh soil that would produce great quantities of the crop. 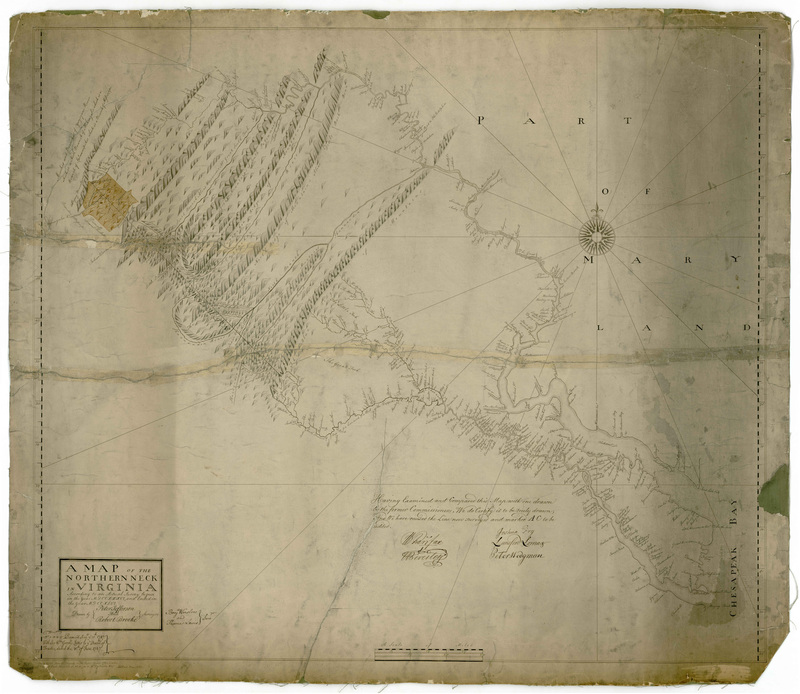 The hunger for new land was fundamental to Virginia's colonial claims to the Ohio River Valley and to Kentucky. 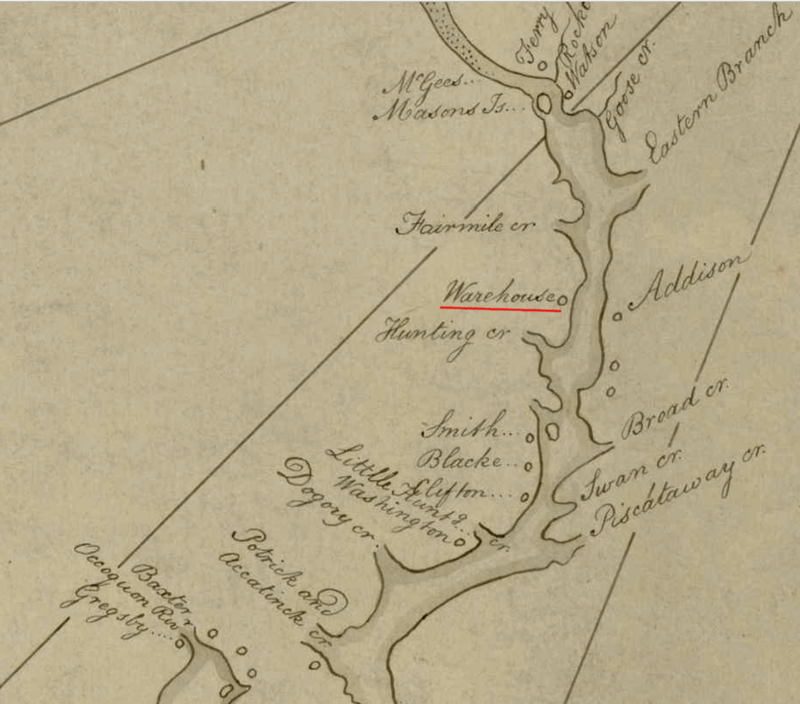 Virginians seeking new places to grow tobacco created conflicts with Native American tribes long after Powhatan's paramount chiefdom had been subjugated and the Coastal Plain had been occupied by European trespassers. 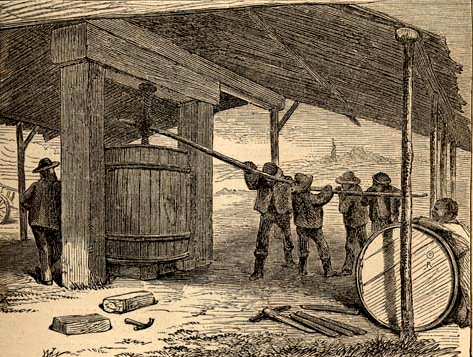 Early towns in Virginia, including Alexandria, developed at locations where tobacco inspection stations and warehouses were built. Growing tobacco is very labor-intensive, so in the 1600's the Virginia gentry who had acquired land needed to import a labor force. Imports of indentured servants were spurred by grants of headrights, but the supply of interested immigrants from England declined after the end of the English Civil War and restoration of Charles II to the throne in 1660. Religious and economic refugees were recruited from France and what today is Germany in the 1700's, as were the Scottish settlers in Ireland who sought greater opportunity in the New World. However, by 1700 it was clear that the Virginian leaders had committed to getting their labor from Africa. In the second half of the 17th Century the Virginia gentry institutionalized and expanded slavery for one primary reason: to obtain the labor needed to farm tobacco. Without tobacco, slavery in Virginia may have died out as the practice did in the northern states - and without the economic factor of slavery, Virginia might have chosen to stay with the Union rather than join the Confederacy in the American Civil War in 1861-65. Tobacco seeds are very, very tiny. Tobacco seedlings are grown in seedbeds of very fine soil, then transplanted to farm fields in the late spring after all danger of frost is past. Each slave or indentured servant working on a tobacco plantation in colonial days may have planted and weeded about two acres of cleared land with 9-10,000 plants a year, requiring bending over perhaps 50,000 times. [B]ecause the main crops, tobacco for export and corn for subsistence, were very demanding of soil nutrients, they required long rotations after short use if the land was to regain its fertility without manuring. The planter could grow tobacco for three years, followed by another three of corn, which has a deeper root system than tobacco and hence draws on another layer of soil, but the land then had to lie fallow for 20 years before yields could once again be profitable. To maintain this rotation, the planter required 20 acres per hand, just for these two crops. 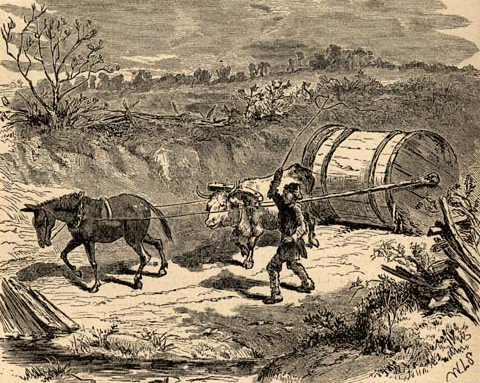 Second, while seventeenth century planters introduced domestic livestock, they did not pen and feed it... and hence could not use animal manure. Long rotations were therefore the rule. Tobacco has been grown in nearly every Virginia county. 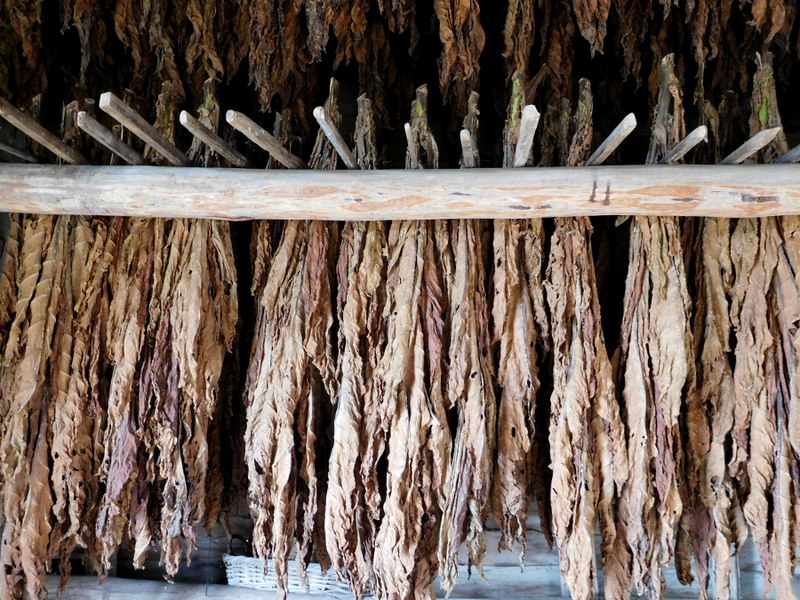 Tobacco culture has evolved over the centuries, and has become an essential element of what makes Virginia unique. However, the tobacco-growing counties now are almost all in Southside and Southwest Virginia, and few urban Virginians have ever walked in a tobacco field, pulled suckers, topped plants, or even seen the crop harvested. 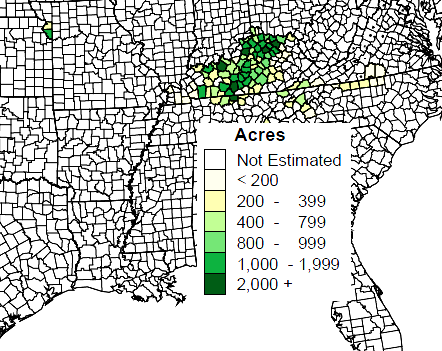 Today the process of growing tobacco is still labor-intensive, but profits from several acres of tobacco can exceed the profits from many more acres planted in corn or soybeans. Different types of tobacco are grown in different places. In the United States, tobacco is a regional crop, concentrated in the Southeastern United States. Pennsylvania farmers grow cigar filler, while Connecticut River valley farmers produce the leaves used for cigar wrappers by growing tobacco plants under white cloth to reduce the number of spots from the sun and insects. Tobacco is also grown in large quantities in Zimbabwe, China - and especially in Brazil. Tobacco is not a homogeneous product. The flavor, mildness, texture, tar, nicotine, and sugar content vary considerably across varieties or types of tobacco. Defining characteristics of different tobacco types include the curing process (flue-, air-, sun-cured) and leaf color (light or dark), size, and thickness. A given type of tobacco has a different quality depending on where it is grown, its position on the stalk (leaves near the bottom of the stalk are lower in quality), and weather conditions during growing and curing. Bright tobacco (also known as "flue cured" or "Virginia" tobacco) is grown in the Piedmont and Coastal Plain from Northern Florida to Maryland. Strip the paper from a cigarette today, and the different color of tobaccos inside are obvious. Typically the darker-colored tobaccos are burley and the lighter-colored tobaccos are "bright," but foreign tobaccos are also added to almost every cigarette. The use of Turkish tobacco led to one brand being named Camels. Many different brands use that same tobacco, blending it with other types in different ratios to create unique flavors. Local regions in the Southeastern United States that grow bright tobacco are known traditionally as "belts." Tobacco used to be sold at auctions in warehouses in small southern towns. Auctions were held in sequence, moving north as the crop ripened from the "Georgia Belt" in August to the "Old Belt" in Virginia in late Fall. Climate plays a role. The harvest in Georgia is over by late August, but in Virginia the end of the harvest for flue-tobacco or "Type 11" tobacco is mid-October. 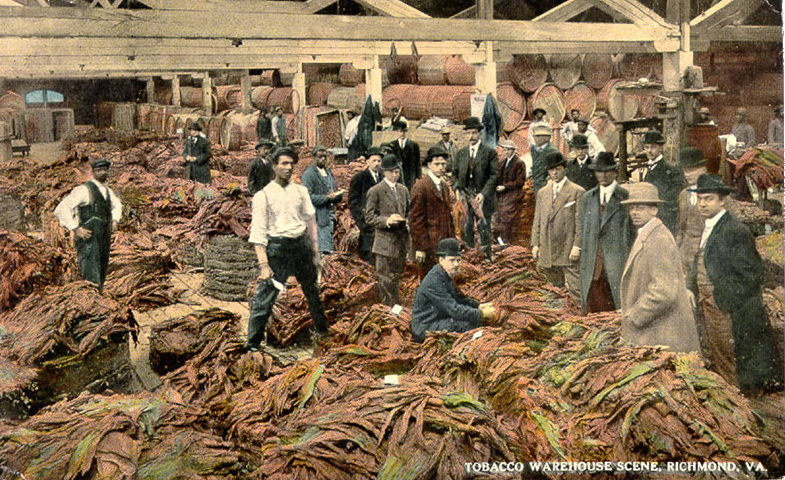 Farmers would bring their crop to a warehouse, and bidders from different tobacco companies (such as Philip Morris) would walk along piles of tobacco arranged in long rows. An auctioneer would chant the bids until finally announcing the price at which each pile was sold. The bidders walked at a steady pace, and it might take just 10-15 seconds at each pile until the auctioneer concluded his sing-song chant of the bids with "Sold American!" (if purchased by the American Tobacco Company, for example). A clerk trailing the bidders would write the price and the buying company on a ticket, which he would toss on each pile. After examining all the tickets on his piles, the tobacco farmer would discover if he had made a profit that year. The warehouse auction process has almost disappeared now. Farmers are contracting in the Spring with a specific tobacco company to sell the crop, eliminating the competitive bidding in the Fall. Small Virginia towns that had tobacco warehouses, such as South Hill, have lost both the economic activity of the crowd that came to auctions and an activity that reflected the unique culture of the tobacco growing community. After a farmer sold his tobacco, the leaves were shipped to processing plants, where chopping and blending created different combinations with different flavors. 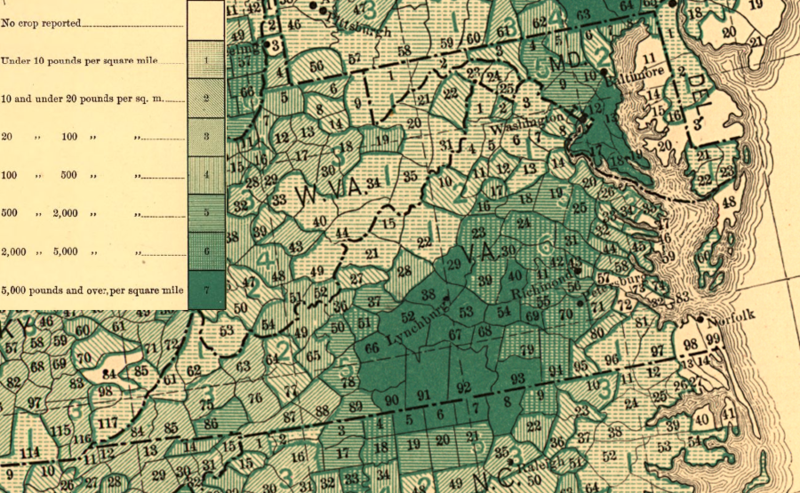 Major centers of tobacco manufacturing were Lynchburg, Petersburg, and Richmond. After the Civil War, North Carolina emerged as the center of tobacco processing, and cigarette brands named after Winston and Salem commemorated manufacturing centers in that state. Richmond is still dotted with old tobacco facilities. The Liggett and Myers cigarette manufacturing plant in downtown Richmond is now an office building. Tobacco storage warehouses on the slopes of Church Hill are being converted into housing for young, upwardly-mobile professionals. Twenty-five years ago, it was common in the early morning for the whole downtown to smell of ripening tobacco. 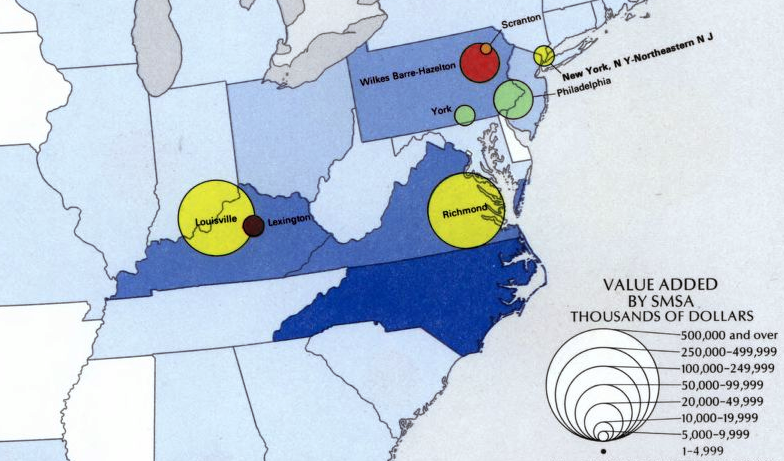 The closest warehouses now are several miles south of town - as you drive by on I-95, look for the blue sheds with "Shh! Tobacco sleeping" sign. 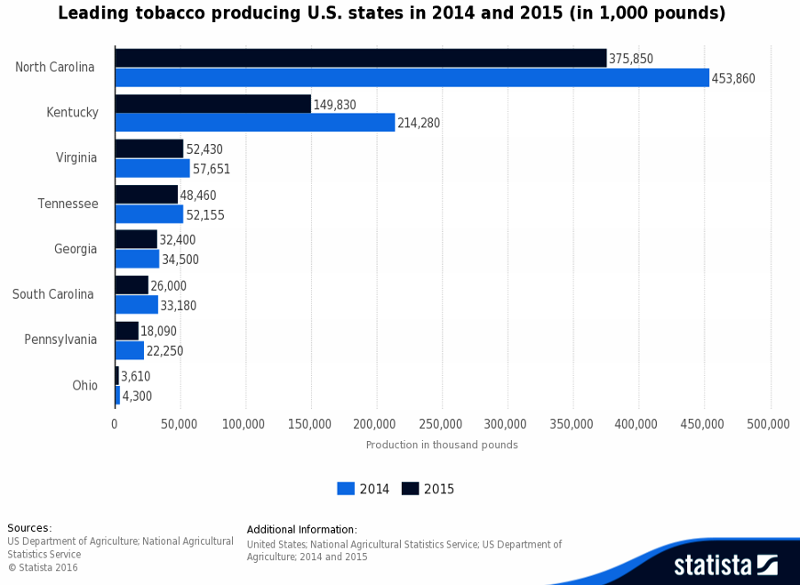 Four types of tobacco were raised by Virginia farmers, but one specialty version is no longer grown in sufficient quality to be recorded in the government statistics. Virginia tobacco farmers grow bright tobacco (classified by the US Department of Agriculture as flue-tobacco or Type 11) in what USDA calls the Piedmont District (basically Southside Virginia, east of the Blue Ridge). Burley (Type 31) tobacco is grown primarily in Southwestern Virginia. The Blue Ridge separates the bright and burley regions. 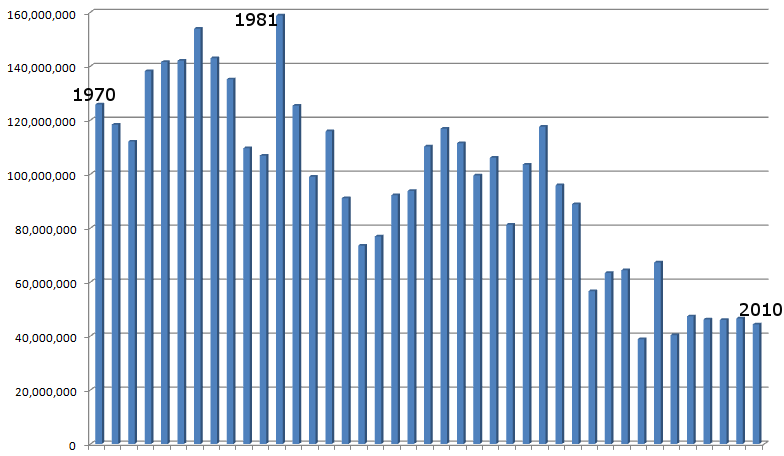 Until the mid-1990's, 98% of the burley in Virginia was grown west of Patrick County. 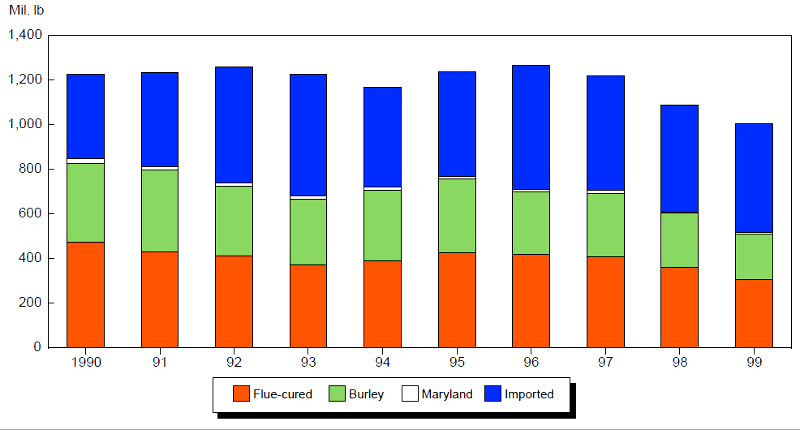 In addition, small amounts of tobacco classified as fire-cured (Type 21, cured with smoke) and sun (Type 37, cured in direct sunlight) are grown in Virginia. Sun-cured tobaccos, often grown in Turkey and the Balkans, are added to many types of cigarettes to add aroma. Bright tobacco leaves are picked as they ripen, the bottom leaves first. The requirement to make multiple trips through the tobacco fields, to harvest leaves as they ripen, is one reason tobacco is still a labor intensive crop. The picked leaves are flue-cured. A half-dozen or so leaves will be tied together at their base, and the bundles will be hung in air-tight barns. The barns are heated by propane burners located outside the barn, with flues carrying the heat into the barn to bake the leaves slowly. As the green tobacco leaves dry out and cure in the dry heat, the leaves turn yellow with brown "sugar spots." Burley leaves are harvested all at once, by cutting the tobacco plant stalk at ground level. Leaves are left attached to the stalk, which is speared onto a stick and then hung in long rows at the top of barns to dry until brown. Burley barns are not air-tight, and the leaves dry in the cool autumn air without extra heat. Air circulation in the barn is increased by bending every other board away from the barn wall. Drying is essential to prevent the leaves from rotting, and ultimately to allow them to burn in cigarettes, pipes, cigars, etc. Fire-cured leaves are smoked in barns, in a process similar to smoking meat. Stalks are harvested similar to burley, so farmers make just one pass through the fields. 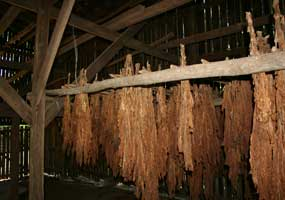 Tobacco stalks are hung on racks, where leaves are exposed to several days of heat and smoke from hardwood fires. Unfortunately for Virginia farmers who appreciate the income from tobacco, the harvest is declining in quantity and value now. 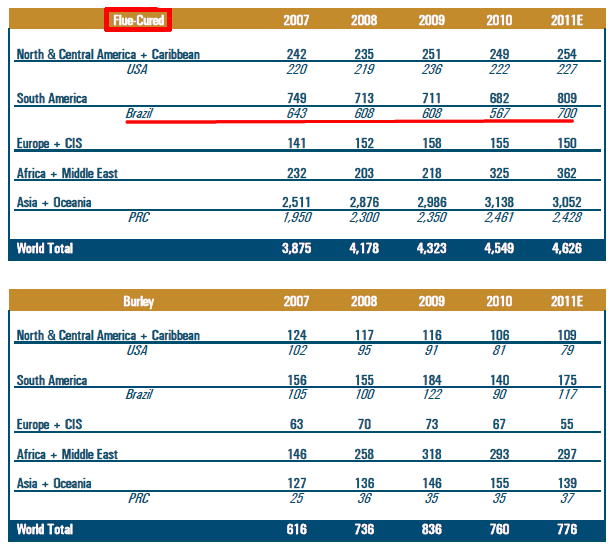 This is due in part because the supply of tobacco has increased as manufacturers - mostly cigarette companies - are importing cheaper tobacco from Africa and China and South America. Brazil is now the world's largest producer of flue-cured tobacco. The manufacturers blend tobacco material from different locations to get the preferred combination for taste, burning rate, and cost. The use of imported tobacco is not new in Virginia. The logo for the Camel brand of cigarette was legitimately exotic. Turkish tobacco has added intense flavor to Virginia-made cigarettes for almost a century. Today, "unmanufactured tobacco" is one of the major commodities imported as well as exported through Norfolk. James I - "A Counterblaste to Tobacco"